John Dinges is a former foreign correspondent and the author of three books on major events involving the United States and Latin America. He was a special correspondent in Chile and Central America for The Washington Post, where he also worked as a foreign desk editor. He served as deputy foreign editor and managing editor of National Public Radio News. Mr. Dinges is the recipient of the Maria Moors Cabot Prize for excellence in Latin American reporting, and the Media Award of the Latin American Studies Association. He also shared two DuPont-Columbia University prizes for broadcast journalism, as NPR managing editor. He is currently on the faculty of the Columbia University Graduate School of Journalism. He has an MA in Latin American studies from Stanford University. 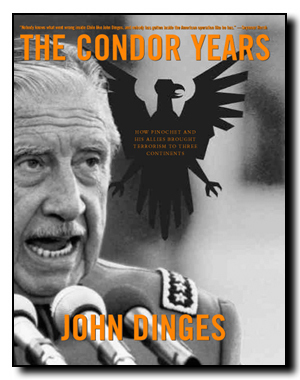 Mr. Dinges� most recent book is The Condor Years: How Pinochet and his Allies Brought Terrorism to Three Continents (The New Press 2004), an account of international assassinations and secret police coordination in South America, the United States and Europe. His book (with Saul Landau), Assassination on Embassy Row (Pantheon 1980), (Asesinato en Washington, Lasser 1980, Planeta 1990), investigates the murder of Orlando Letelier in Washington. He is also the author of Our Man in Panama: The Shrewd Rise and Brutal Fall of Manuel Noriega (Random House 1990; Times books 1991). He is the editor of two guides to public radio ethics and journalistic standards: Sound Reporting (Kendall-Hunt 1992) and Independence and Integrity (NPR 1995). John Dinges lives in Washington and New York. He is married to Carolina Kenrick, to whom his latest book is dedicated. They have three children: Tom�s, Sebasti�n and Camila. Columbia University Graduate School of Journalism, profesor y director del programa de radio. 1996-presente. National Public Radio, 1985-1996. Puestos: Editor internacional, managing editor, editorial director. Washington Post. Corresponsal especial en America Latina, editor asistente en mesa de noticias internacionales. 1975-83. Como reportero y escritor, se especializa en periodismo de investigacion en temas de terrorismo de estado, derechos humanos, inteligencia, y trafico de drogas en America Latina. Asesinato en Washington (con Saul Landau) Pantheon 1980, Planeta 1990 (sobre el caso Letelier). Nuestro Hombre en Panama (Random House 1990) (sobre Manuel Noriega y la invasion de Panama por EEUU). Premio Maria Moors Cabot 1992, para cobertura de America Latina. Premios DuPont Columbia (1993 y 1995) para cobertura de la Guerra del Golfo, y Excelencia en Periodismo Radial (como editor dirigente de NPR).